No brite white. Do not paint the walls bright white. This will just accentuate the pink. How about a light brown or a gray that harmonizes nicely with your particlar pink. The goal is: Balance…equilibrium…between the wall and the tile. Yellow for perky-today. You can use the same technique using yellow paint for the walls. A year ago, Portland Amy sent this story from Real Simple magazine. I know a lot of folks love this bathroom. It doesn’t feel ‘retro,’ I think, because we are not accustomed to seeing pink and yellow together. Also, because it uses other, more contemporary floral references — especially in the shower curtain and rug. …Jewel tones. Accent colors should have some force — jewel tones are good. Anything quieter than your pink will get lost. You want your accent color(s) to emerge — from the pink — and keep your eye dancing around the bathroom. My bathroom. Design elements: Color, pattern, size, scale, texture. 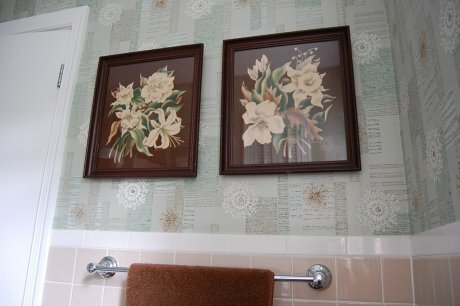 Patterns, for example: square (tile), atomic (wallpaper), floral (prints). Colors: rose beige, aqua, turquoise, brown, white. The same formula works in ANY bathroom. Artwork to scale. The first place that I would work to integrate an accent color would be in a good-sized piece of artwork. Look for a piece, or pieces, that use your two main colors (yes, including the pink) as well. Don’t be too dinky with your art — or, mass smaller things into one grouping. Continue adding art until you’re happy. Clutter isn’t good either, so take it slow, edit. Shower curtain. When in doubt, match your shower curtain to your paint color. A subtle weave might be good – to add texture and visual interest. If you are feeling more daring, use your shower curtain to bring more color into the room – being sure to include references to your tile and paint colors, as well. 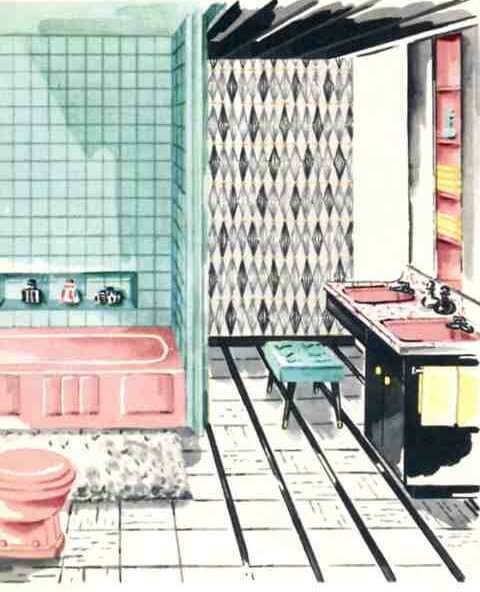 Probably too retro for anyone who already does not like their pink bathroom — but it illustrates some great ideas on how to play with color and pattern. Soft goods. Towels and rugs can match the wall color or be a few shades darker…And, I’d buy a second set in an accent color as well. This can be really pretty. Window treatments = pattern. Window treatments are a great place to add pattern — and fabric softens up the hard edges of tile. 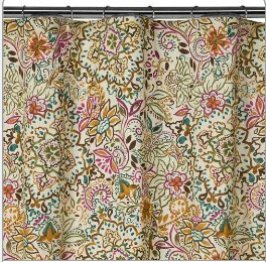 How about an inexpensive pleated shade for privacy and light control, and soft and decorative curtains on a pretty rod to frame the window. Bathroom jewelry. Ensure you have an eye-catching light fixture…and mirror…and the waste-basket is a great place to have fun, too. Cindy’s bathroom has great balance between what’s going on with the tile and what’s going on with the walls. I’d call it — artsy/eclectic…When I was in it, I didn’t think “pink,” I thought “pretty.” That’s my pretty sister Jenni BTW. Alternative twist #2: Pick up some Rachel Ashwell books at the library — and consider the Shabby Chic look. Put up crystal chandelier light fixtures, add chippy shelving set with pastel colored vases shiny crystal, and add fluffy white towels, some embroidered hand towels and a luxurious linen shower curtain, etc.. If I went for this look, I think I’d paint the walls a very light slight dove gray. Anna over at Door Sixteen used Benjamin Moore Lacey Pearl (matte) on her walls and say “it’s like the world’s palest neutral gray.” That might work well. 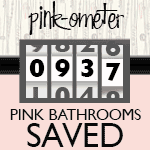 *If you have pink walls and fixtures of yet-another pastel color: Embrace your pink bathroom. Get wallpaper that includes both colors. The retro decorating gods have sent you this jewel for a reason. Wow! I must post a photo soon. I would love to “tone down” my pink bathroom, or even find a way to highlight what I have. The bathroom is pink tile throughout. I’m talking every inch of wall space, ceiling, sink, toilet and floor! Black tile for trim around the one window and doorway and as a baseboard. THEN, a pale yellow tub! Hmmmm. The only place to add any paint is one cupboard and the actual window, which I have in white for now. I have tried to use pale yellow towels and rugs, black, brown, white, and nothing is snazzy. 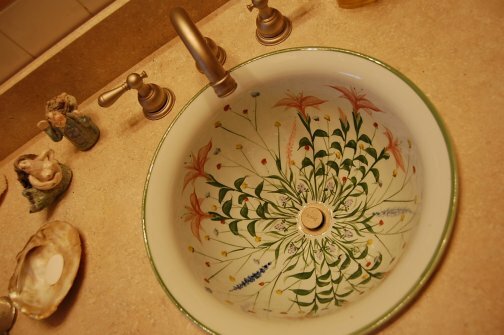 I hope more readers will post photos of what they have done with their vintage baths!! I have a white bathroom with light pink tiles and a pink and grey tiled floor with pink grout. The sink and counters and mirror are all different shades of white. I have glass shower doors. The bathroom is small. Can anyone help me make a sensible color choice? The light colors just look too pink and I really didn’t want a gray bathroom. Are there any other options? We just redid a small bathroom and I was happily surprised to discover that a Dremmel tool equipped with a grout blade really did make it easy to remove the grout. At least you could get rid of that layer of pink! My bathroom has white wall paper with little sprigs of mauve and a dark aqua prints .I have two old home interior shelves that are white.I want to paint the shelves to make my bathrooom look pretty.I need suggestions on color for the shelves that will really change the look .Anybody have a good idea for this . Usually there are colors in a wallpaper, it makes sense to repeat those…So, dark aqua! I have a lavender and white bathroom with lavender poodles in some of the tiles on the wall (i do love it), but i have no idea what colour towels and accessories i could use that aren’t lavender! Someone help me! I love the atomic wallpaper. It’s exactly the look i’m trying to include in my bathroom. Where did you find it? I love both the colors and pattern. Decorating a bathroom with tile on all six walls — yes, ceiling, too! Yes, there are more. 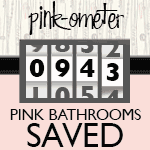 Click here to get to all the stories in our Pink Bathrooms Category.